dōTERRA Melaleuca Tea Tree essential oil is renowned for its cleansing and rejuvenating effect on the skin. For occasional skin irritations, apply 1–2 drops of Melaleuca essential oil onto affected area. For an added cleansing property, combine 1–2 drops with your facial cleanser, or apply to the skin after shaving. Not only is it best for cosmetic care, dōTERRA Melaleuca works great when cleaning hard surfaces. Add a few drops to a spray bottle with water and use on surfaces in your home to protect against environmental and seasonal threats. Add doTERRA Lemongrass to your essential oil collection and you will experience healthy digestion, feelings of peace and awareness, and a soothing sensation when used on muscles and joints. Use Lemongrass in your food or beverages to add flavor and provide additional dietary support. 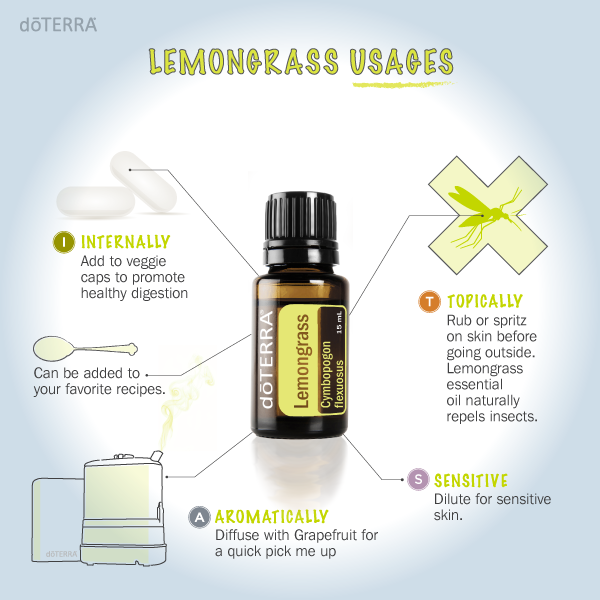 Diffuse Lemongrass when feeling nervous or to assist with fatigue. This unique essential oil is known to promote a positive outlook . I love blending wood oils with citrus oils in the diffuser. Wood oils and root oils are typically low notes in fragrance blending and are beneficial for promoting feelings of groundedness. Citrus oils are high notes that can flash off quickly. Blending those happy citrus oils with a wood oil like Cedarwood is beneficial for balancing moods. Did you know that Cedarwood essential oil was considered by the Sumerians to stem from the Tree of Life? Diffuse Cedarwood with Cypress for a warm scent to promote feelings of confidence and self-esteem within the home. Cedarwood oil also includes the main sesquiterpene constituents cedrene, and thujopsene, which help improve the appearance of skin. Add one to two drops to your toner to help with skin imperfections. Did you know Cypress essential oil is frequently used in spas and by massage therapists? Cypress promotes healthy circulation. Mix Cypress and Grapefruit essential oil with dōTERRA Fractionated Coconut Oil for an enjoyable massage. Cypress essential oil also contains monoterpenes, making it beneficial for oily skin conditions. Add one to two drops to the toner to help improve the appearance of oily skin. Do you love a clean, fresh, and citrus aroma? dōTERRA Lemon essential oil in the perfect combination of all three. Lemon has many purposeful functions, especially when it comes to cleaning surfaces in your home. Add Lemon oil to a spray bottle of water to clean tables, countertops, and other surfaces. Lemon oil also makes a great furniture polish; simply add a few drops to olive oil to clean, protect, and shine wood finishes. Among the many benefits of Cinnamon Bark oil is the powerful *cleansing properties. For this reason, dōTERRA recently formulated a mouthwash that includes Cinnamon Bark oil. Combine a few drops of dōTERRA Cinnamon Bark oil with water in a spray bottle to tackle your little one’s sticky mess. Due to its spicy and sweet flavor, you can substitute it for the powdered spice in baking. Purchase a bottle of dōTERRA Cinnamon Bark oil here! Here’s something just for fun during March and early April on my Instagram Stories and my Essential Oils Daily Community group on Facebook. Players will download the bracket, fill it out, and collectively select the winners. Each few days I will feature a new matchup, and you can vote on the winner. The winner of the first 32 match-ups will move on to the next round. We will follow this pattern until we arrive at a Champion Essential Oil!. Join the fun! **This is not associated with NCAA basketball or sponsored by any affiliates. Facebook and Instagram are not responsible for this game or giveaway in any way. If you’re working with another doTERRA Wellness Advocate, ask to join their community support group. Spearmint is frequently used in salads, drinks, and desserts, but did you know that it has been used for centuries for its digestive benefits*. dōTERRA Spearmint is great for promoting digestion and helps reduce occasional stomach upset*. If you are feeling unwell after eating your favorite foods, add 1-2 drops of Spearmint oil to water and enjoy. I love diffusing Spearmint with Lime or Eucalyptus for a refreshing respiratory support. Shop for Spearmint here, or learn how to add it to your custom curated wellness subscription box! Do you love to try new foods? dōTERRA Ginger is a main ingredient in many Asian dishes for its hot, fragrant flavor. It may be more familiar to you as it’s used more commonly in sweets such as gingerbread and ginger snaps. Before I tried doTERRA, I was not a fan of the aroma of Patchouli. In fact, it took me several years to even order a bottle for our oil stash. Once I tried doTERRA’s Patchouli, blended with the right combination of other oils, I grew to love the aroma. The cosmetic benefits are astounding. Apply it to dry areas to help reduce the appearance of wrinkles and blemishes. When diluted, dōTERRA Patchouli acts as a natural deodorant. The strong and unique scent makes a great base in floral blends. I also love incorporating it with citrus oils for depth. Add dōTERRA Patchouli to your monthly loyalty order here! Experiment with the diffuser blends that include dōTERRA Patchouli, found here. dōTERRA Vetiver has a unique, exotic aroma that’s sweet, woody, caramel, and smoky making it ideal for calming emotions. For a relaxing and stress free evening at home, use Vetiver as a massage oil for the body, diffuse with Lavender, doTERRA Serenity®, or doTERRA Balance® or rub on your feet before bedtime to promote a restful night’s sleep*. You can also add a few drops of Vetiver essential oil to a warm bath for a deeper relaxation. When you add Vetiver to your wellness subscription box, be sure to also have Bergamot and Roman Chamomile on hand. 5 drops of each in a 10 ML. roller, topped with Fractionated Coconut Oil will be your favorite bedtime blend. Are you shopping for someone who loves essential oils? Check out these gifts they will love! I love having lots of totes to take to oil classes or meetings. This one is super cute and affordable. It can be fun to blend custom rollers and perfumes. Putting them in pretty bottles makes it even better. I love the way Lava beads hold on the to the aroma of essential oils all day. This Lava bracelet from Trades of Hope is perfect with every outfit and benefits the artisans in Jordan who hand craft them. 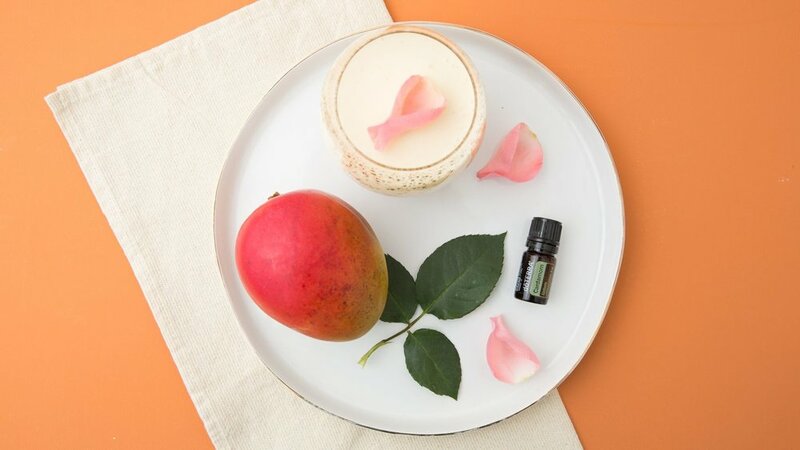 This lovely clutch from doTERRA contains two special blends. Dream was the Gala blend from 2018 Convention. It contains Cedarwood, Pink Pepper, Juniper Berry, Magnolia, Roman Chamomile, Lemon Myrtle, and Osmanthus. Radiant is an exclusive blend as part of this gift set, containing Cananga Flower, Patchouli, Clary Sage and Cypress. We all know OnGuard is the Real OG. This design can be printed on tees of any size and style, hoodies, baby onesies and other accessories! These Shades of Stone holders have been on my wish list for a while. I keep my floral rollers on my vanity to rotate into my skincare routine. Wouldn’t they look perfect in one of these? What items are on your wish list this year? You know I love oils that support many body systems. These oils make it that much easier to simplify our proactive wellness plans. Copaiba is a blend of several species of trees from Brazil. This sourcing video shows the care that goes into the craft of sourcing this beautiful oil. When taken internally, Copaiba essential oil may be calming, soothing and supportive to the nervous system*. dōTERRA Copaiba Softgels are easy to swallow and provide a convenient way to receive the internal benefits of dōTERRA Copaiba essential oil. Use dōTERRA Copaiba Softgels to receive antioxidant support for your cellular health. The softgels also support the health of the respiratory system, the digestive system, the immune system and the cardiovascular system. Take one softgel daily to address concerns with any or all of these systems. When taken on a regular basis, your overall health can improve! We Love OnGuard in Everything! I love reading about the many benefits of the OnGuard blend. We have used the toothpaste successfully for years. I was delighted when doTERRA announced an OnGuard Mouthwash at the 2018 convention. 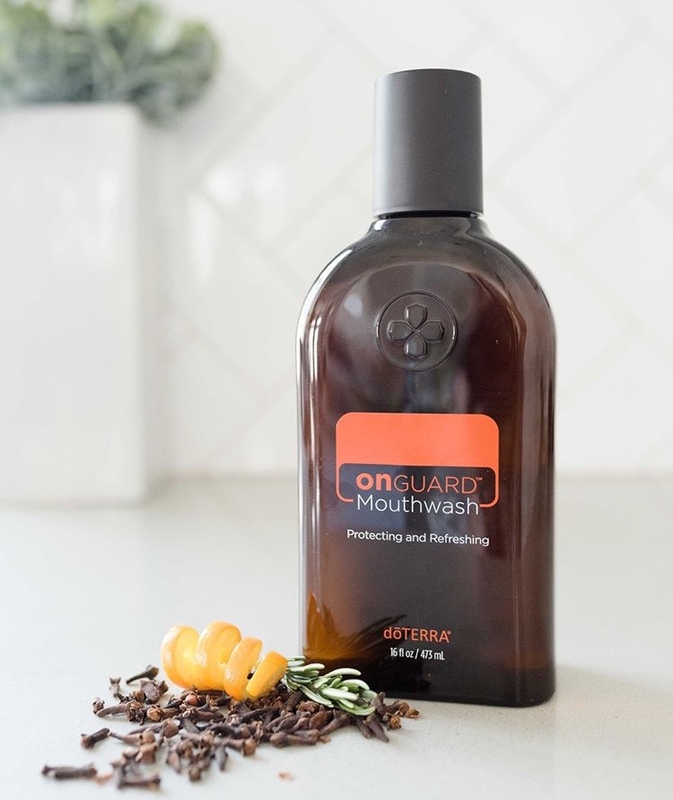 dōTERRA On Guard® Mouthwash is alcohol-free and formulated to clean teeth and gums, reduce plaque, and promote a healthy–looking mouth when used as part of a hygiene routine that includes brushing and flossing. Use dōTERRA On Guard® Mouthwash morning and night after brushing teeth with doTERRA On Guard Natural Whitening Toothpaste by swishing it thoroughly for 60 seconds. Be sure to shake well before each use. I can't get enough of this Beautiful Body Mist. Which is better--turmeric powder or turmeric essential oil? As a key botanical of the traditional Ayurvedic health practices of India, turmeric root and turmeric essential oil have a long history that has inspired modern uses of turmeric today. Steam distilled from the turmeric root, Turmeric essential oil has two unique chemical components, Turmerone and ar-Turmerone. Most commonly known for their nervous system* and emotional benefits, these components make Turmeric essential oil a staple in your daily health routine. Promoting feelings of positivity,* Turmeric is beneficial both internally and aromatically. Advantageous to the immune system, Turmeric may have soothing benefits that promote a positive immune response. * As well, Turmeric can help to promote clear, smooth, and radiant-looking skin. Use Turmeric daily to support healthy immune function and response along with healthy circulation. * In addition to the many benefits of Turmeric essential oil, Turmeric acts as a great burst of flavor to your favorite savory meals. If you’re like me, you are using many different methods to keep your family healthy. We have been eating well, moving our bodies, taking supplements and, of course, using essential oils. I was delighted when Emily Wright announced Pink Pepper as one of our permanent oils! I fell in love with Pink Pepper when we experienced it as a Mother’s Day gift, but I had no idea what a powerful tool it would be in our wellness tool kits! Known for its ability to strengthen the immune system and maintain healthy cellular function, doTERRA’s Pink Pepper can be taken internally to avoid *seasonal threats. Additional benefits include; support of a healthy immune, digestive, and respiratory systems. Pink Pepper can also be relaxing to the nervous system. Add the new doTERRA Pink Pepper to your oil collection and purchase it here. The Co-Impact Sourcing story is truly remarkable! A Natural Deodorant that Actually Works! It can be difficult to find a natural deodorant that works for you and smells good. Our essential oils of Spruce, Ho Leaf, Frankincense, Blue Tansy, Blue Chamomile and Osmanthus work to provide protection against moisture and provides long-lasting freshness. For only $11.67 retail or $8.75 wholesale, you can enjoy the natural benefits of the Natural Deodorant with doTERRA Balance. This product is aluminum, paraben, phthalate and talc free! 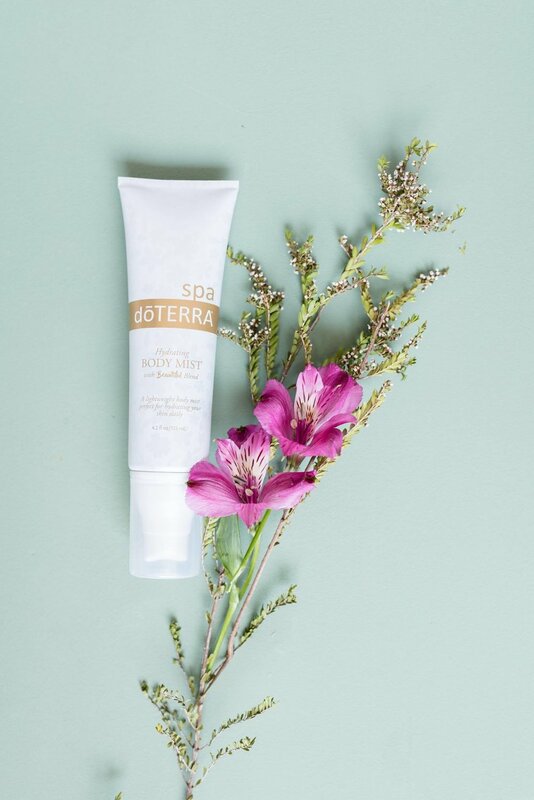 With Arrowroot powder and baking soda infused, the doTERRA Natural Balance Deodorant absorbs moisture leaving you feeling fresh and dry, while neutralizing and preventing odors throughout the day. This natural deodorant actually works! When I’m traveling, I love to bring along oils that can be used for more than one purpose. dōTERRA Cardamom is one I always keep in my bag because it can support healthy digestion, respiratory function, and clear thinking. As we travel for the holidays I can be a hero with Cardamom. It helps ease any indigestion with Cardamom. * When taken internally, Cardamom may help soothe occasional stomach discomfort. * Dilute one drop in a 4fl. oz. of liquid. Not only is dōTERRA Cardamom great for cooking and maintaining overall gastrointestinal health*, it also promotes a sense of openness and mental clarity when diffused or inhaled. We may diffuse Cardamom with Grapefruit in the car diffuser to uplift moods. What is your favorite use for Cardamom?